In 2003, the international community-based HIV/Aids initiative, WE-ACTx, was founded in response to an urgent global appeal from Rwandan genocide survivors for help in accessing Aids medications. Initially, the WE-ACTx team, consisting of Aids physicians, activists and researchers, did exactly what most of us would do. They built a hospital and sought to provide as much medical support as they could. However, the medical team soon realised that in a post-genocide and conflict-shattered country, there were wounds that even the best doctors, hospitals and medications cannot heal. Where does a physiologically-starved society – not to mention the lack of safety and sometimes love, belonging and esteem – actually find the strength for self-actualisation, self-transformation and self-articulation? Galtung’s famous book, Peace by Peaceful Means (1996), addressed the issue in arguing that in a conflict-shattered society, persons cultivating inner peace would be much more capable of bringing about outer peace as well. Surprisingly, research and practice still marginalise the topic of individual trauma healing and pay significantly greater attention to the various forms of collective methods and mechanisms directed towards reconciliation and societal cohesion. While these are undoubtedly extremely important efforts, they sideline one essential feature required for a stable, long-lasting and socially embedded peace: individual physiological wellbeing. It remains hitherto unexplored how individual trauma healing can actually contribute to the peacebuilding and development process of a society as a whole, either in the short or long-term. In the case of WE-ACTx, the quest to assist locals to overcome some of the most intractable effects of trauma led to the launch of an experimental undertaking in 2007: Project Air. This is the first initiative, formally endorsed by the United Nations, to help vulnerable Rwandan girls and women to heal and mend both their minds and their bodies – with yoga. (…) it seemed as if something inside them [the women] began to stir, to shift. This was something below the level of thought, below the level of memory, below the level of conscious feeling even, but when it was sparked, it was as if—and I don’t know how else to put this—it was as if the women became able to feel again and so love again the life that was in them. 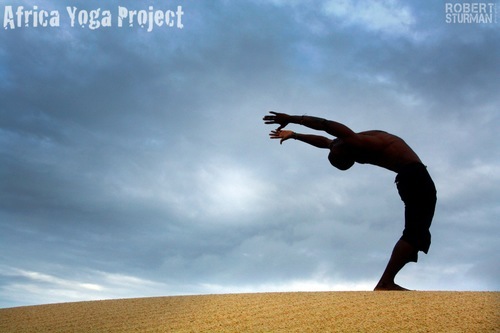 It is noteworthy that Project Air is not the only yoga initiative in Africa. Other outstanding projects include the Africa Yoga Project and the Mandala House. A millennia-old tradition with roots in India, yoga has experienced a rapid growth in popularity in the West since the 1960s. Whereas for some, yoga is simply an activity to sustain physical health, mental health and strength, for others, it has also become a spiritual awakening. On whatever side of the pendulum one may stand, there are proven benefits. In an article from The Journal of Internal Medicine, on the ‘Characteristics of Yoga Users’ (2008), medical scientists came to the following two conclusions. Firstly, yoga users are more likely to be white, female, young and college educated. Therefore, as a practice, it is still largely accessible to/and enjoyed by the privileged class in the West. Secondly, yoga users report benefits for musculoskeletal conditions as well as mental health, indicating that further research on the efficacy of yoga for the treatment and/or prevention of these conditions is necessary. Indeed, there is a growing consensus among medical scientists that mind-body techniques, such as meditation and yoga practice, assist the proper functioning of both the biochemical and the neurological systems. Most psychologists treat the mind as disembodied, a phenomenon with little or no connection to the physical body. Conversely, physicians treat the body with no regard to the mind or the emotions. But the body and the mind are not separate, and we cannot treat one without the other. In short, bending, twisting and flexing our body in all possible directions affects our brain, and meditation has an effect on both our physical and mental health. The maxim behind yoga is thus quite simple: practice and it will come to you. By addressing both mental and social factors and how they relate to the symptoms of a disease, yoga brings a holistic element to treatment. Practising yoga in Africa not only brings about new challenges but also gains an entirely new dimension. Exercise makes one hungry and yoga practitioners cannot often afford the food required for a healthy practice. Project Air thus provides food for all participants. Likewise, the Africa Yoga Project is further dedicated to supporting economic development and the alleviation of poverty by creating a local market for yoga in Kenya. Now, almost all the yoga teachers in the country are of Kenyan nationality, therefore yoga is also providing some practitioners with regular income. Besides, yoga is certainly not the only method in Africa for healing individual traumas. Local forms of chanting, praying and dancing as well as several other types of sports in combination with psychological assistance can all provide the same neurological effect. However, we are precisely at the juncture where current efforts to build peace and foster development have not kept up with developments in neurological science on the benefits of Denninger’s so-called ‘Relaxation Response’. Even though it is obvious to most of us that peace must be cultivated first from within before it can spread collectively the benefits of inner healing and the potential of local and cultural mechanisms and techniques in war-torn societies remain barely explored in research and practice. One reason for this is that there are so many pressing needs. The big questions for officials and practitioners—as well as for academics pondering the rebuilding of failed states—are therefore very simple: Where do we start? What should be tackled first on such a long list of priorities? Which areas are crucial to ensuring that the country does not relapse into conflict? In acknowledging that peacebuilding and development have to be an all-encompassing and integrated process, international organisations generally provide support for areas such as security, DDR (disarmament, demobilisation and reintegration), transitional justice, good governance, water and sanitation, and employment generation or education. Even though these are all critical areas, they nonetheless obscure how people come to terms with the pressure, stress and anxiety of living in a war-torn and often severely impoverished environment and society. This is precisely the kind of stress that can eventually lead to recurring violence, anger and resentment at both the individual and the collective level. What is more, most peacebuilding and development initiatives simply do not have the mandate, funds, time or capacities to provide the urgently needed individual support for victims, veterans and (child) soldiers alike. Above all, how to overcome anxiety attacks and depression is neither an outspoken nor a widely socially accepted topic in Western societies either.